Complete with real orange peels. It’s what makes this meal perfect! 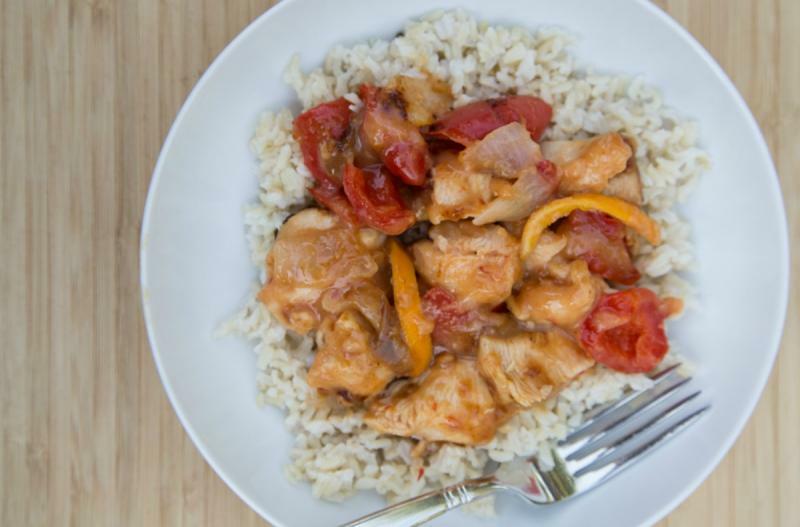 It’s the sweet Thai chili sauce with the orange peels that leak out all their flavors and aromatics into the sauce. Perfection in a bowl right here. Seed and dice the red bell pepper. In a small mixing bowl, mix together the flour, garlic powder, onion powder, salt and grated orange peel. Toss the chicken pieces in with the dry mix until they are fully coated. In a large skillet, heat the oil and then add the coated chicken pieces and toss often to brown all sides. Add the diced onions and red bell pepper with the chicken and saute as the chicken is browning. Pour the sweet chili sauce over the top and bring to bubbling and finish cooking the chicken over low heat. If necessary, deglaze the skillet with a little water. 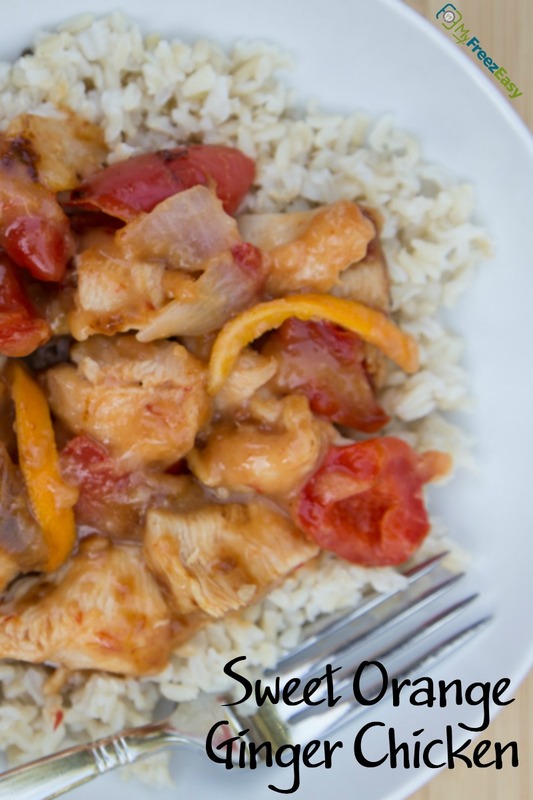 Serve Sweet Orange Ginger Chicken over rice. Cut 4 large chicken breasts into bite-size pieces. Dice 2 small white onions. Put baggie in the freezer and freeze up to 6 months in fridge freezer or 12 months in a deep freezer. Thaw in the fridge overnight, or a warm bowl of water for about 20 minutes, before transferring to the skillet for reheating. When assembling the chicken in the bag, toss the pieces with the dry ingredients within the gallon size freezer baggie so the flour and spices coats the chicken. Then add the onions, bell peppers and sauce. Thaw completely before sauteing in skillet for 10 to 15 minutes, or until chicken is cooked through.